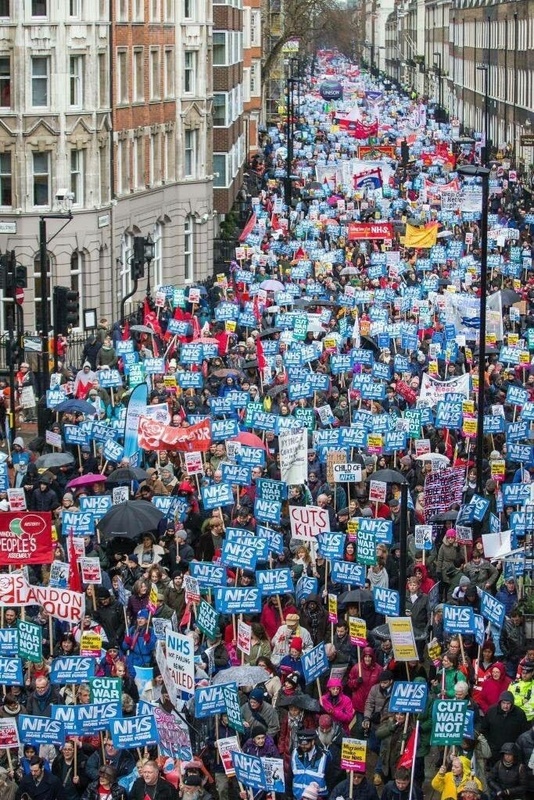 Thank you to all of you who made up a part of the 60,000-strong crowd who marched on Downing Street on the 3rd February and to all the campaigners around the country who staged 55 local events and demonstrations calling on the Government to fix the NHS. Health Campaigns Together and The People's Assembly Against Austerity did a fantastic job organising the London demonstration. 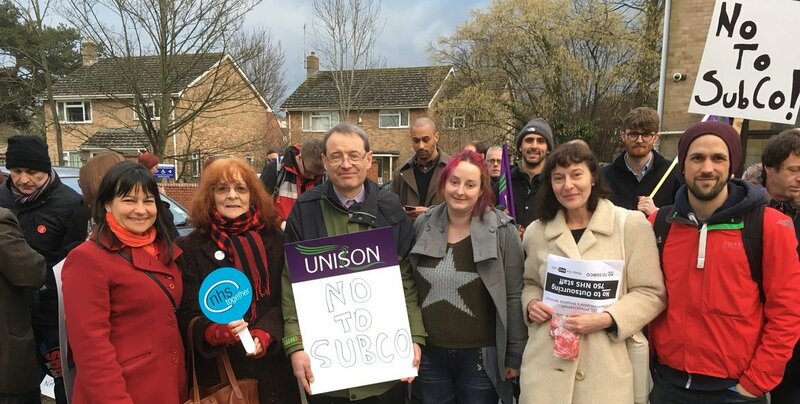 HCT's website highlights some of the local campaigns with pictures sent in throughout the day and you can see updates sent in from Gloucestershire, Southampton, Liverpool, Leicester and The North East here. The PA's Facebook page has videos from the end rally at Downing St of the London demonstration - 'NHS in Crisis - Fix it Now!'. There were speeches from Jon Ashworth, Shadow Secretary of State for Health & Social Care, actor (and Twitter tormentor of Jeremy Hunt) Ralf Little, Jonathan Bartley (joint Chair Green Party), from Unite, Unison and the RCN, and from many inspirational campaigners for the NHS - including David Bailey and Nicola Romero. Listen to these moving orations (video) and also Tony O'Sullivan, KONP Co-chair's impassioned speech on behalf of KONP and HCT (37 minutes in). 55 events in four countries took place on or around 3 February! Unprecedented support for the NHS - read more here. 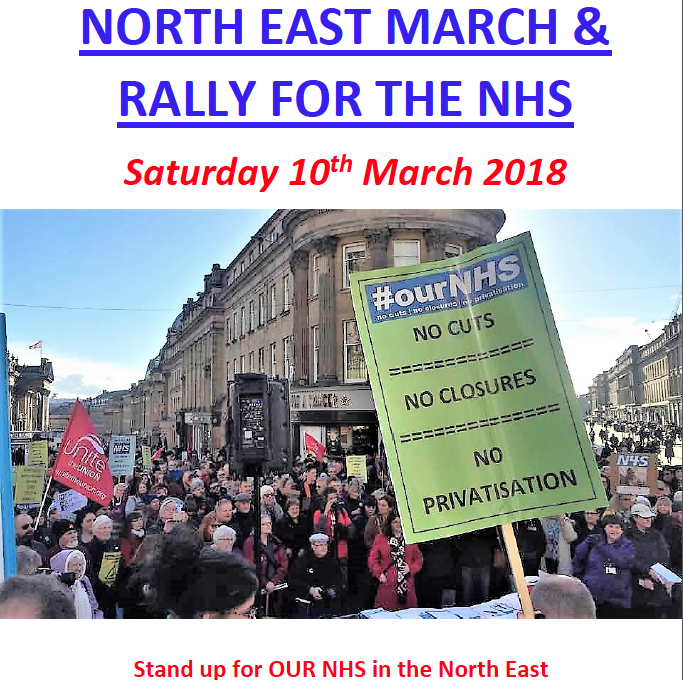 NHS 70th Birthday Demonstrations - Save The Date! The People's Assembly and Health Campaigns Together are organising a national demonstration in London. 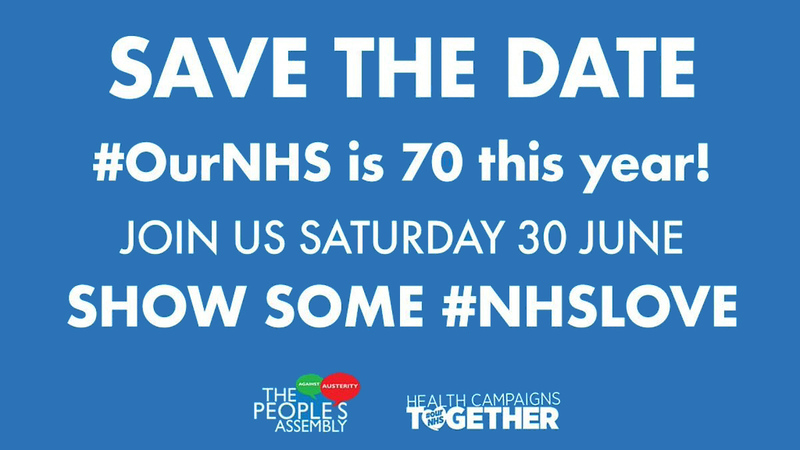 They are calling on all campaigners and NHS lovers to earmark the 30th June to celebrate the NHS' 70th year and call on the Government to return it to a fully comprehensive, universal, publicly funded, publicly owned, publicly provided and publicly accountable, national health service. Local events, demonstrations, and celebrations on the 5th July are also encouraged. 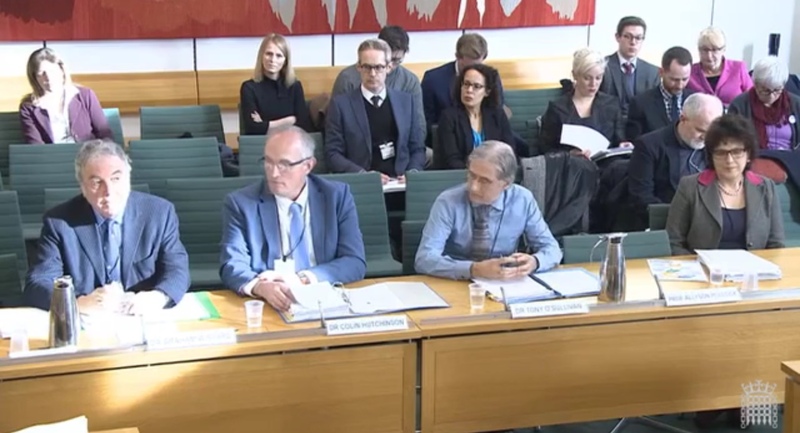 On Tuesday 27th February KONP co-chair, Tony O'Sullivan, joined Dr Graham Winyard, Dr Colin Hutchinson and Professor Allyson Pollock to give evidence to the Health & Social Care Select Committee (HSC) on Sustainability and Transformation Plans (STPs) and Accountable Care Systems and Organisations (ACSs/ACOs). Tony O'Sullivan has written a report for the website which you can read here. You can watch the panel's excellent performance via Parliament TV. The second sitting is also very good and well worth watching. BMA chair Dr Chaand Nagpaul, Helga Pile (Deputy Head of Health, Unison) and Lara Carmona (Director of Strategy, Royal College of Nursing) all gave very good testimony. Virgin Care had won the £104 million contract to run the county's 0-19 Healthy Child Programme from Lancashire County Council beating Lancashire Care NHS Foundation in the process. The switch was due to take place on April 1, but Justice Peter Fraser has blocked the move in the High Court after a legal challenge by the two current providers of the service, Lancashire Care and Blackpool Teaching Hospitals NHS Foundation Trust. They claimed that the decision would disrupt other clinical pathways provided by the trusts, would cost them more than £2m and result in 160 staff losing their jobs. This wonderful news has to be a blow to privatisation and Virgin Care who have sunk so low as to threaten to sue the NHS after losing out on a contract in Surrey. A full hearing is scheduled to take place in April and you can read more about the judge's decision in the Independent and the Lancashire Telegraph. 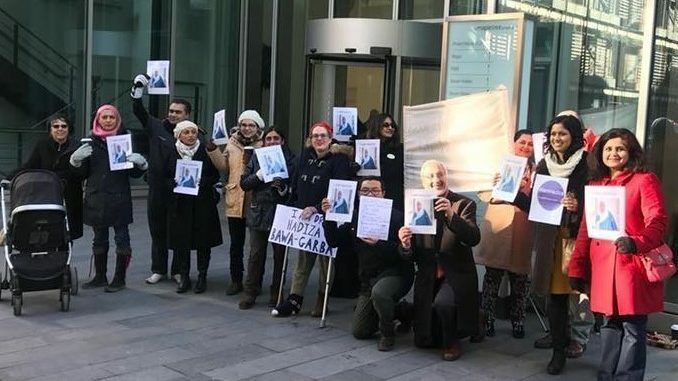 KONP are joining doctors and campaigners in asking people to sign and circulate a letter to the General Medical Council (GMC) and its chief executive, Charles Massey, protesting the GMC’s role and decision on the case of Dr Hadiza Bawa-Garba, which has resulted in her being struck off the Medical Register. Dr Bawa-Garba, a paediatric trainee with a previously unblemished record, was convicted of gross negligence manslaughter. Doctors are concerned that the sentence does not take into account the gross systemic failures that contributed to the tragic death of Jack Adcock. Please see our post on this to read, sign and share the letter. JR4NHS have raised £100,000 through their crowdfunding website. Thank you so much to all those who have donated. Carol Ackroyd, a member of the KONP executive committee, has written a post for the website explaining KONP's position on funding for the NHS. KONP calls on politicians from all parties to reject these repeated calls for a hypothecated NI tax for the NHS, and to support full and fair funding for the NHS through general taxation. KONP affiliate NHS Support Federation have written an excellent article exposing the growing number of reports of cash-strapped hospital trusts announcing plans to develop private companies to employ non-clinical staff. The article gives examples and details of this 'spin-off company' privatisation happening in Yeovil Hospital, Bath, York and Gloucester. In January 2018, Southmead Hospital in Bristol part of North Bristol Trust announced that it was considering setting up a spin-off company to employ the non-clinical staff in the hospital trust in an effort to save money. 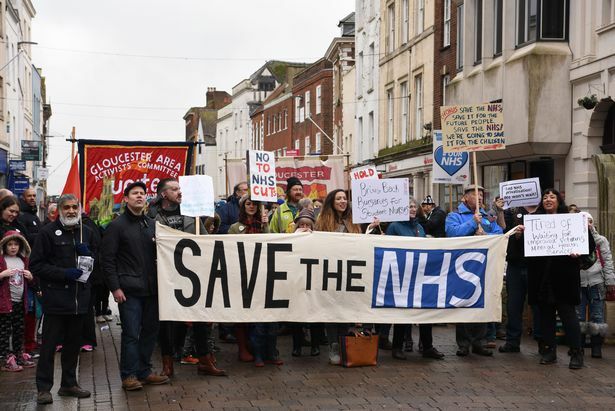 However, following a campaign by the unions and other campaign groups, plus a backlash from the staff themselves, the trust has dropped the plans. Well done to campaigners, UNISON, and NHS staff in Bristol who contributed to the dropping of these plans. Please keep an eye out for this type of back-door privatisation in your local area (NB: see the report from Gloucestershire below) and visit NHS Support Federation's website for more information and articles on the ongoing privatisation of the NHS. The Board has approved the plans to establish a wholly owned subsidiary company (SubCo) effective from 1st April 2018. The company will employ around 675 support staff in estates and facilities, sterile services, and materials management functions. The setting up of this subsidiary company has been opposed by over 900 staff who have signed a petition against implementing the plans. We are extremely disappointed to hear this - the whole SubCo proposal and process stinks. The VAT-avoidance is fishy, £200,000 has been budgeted for advice from dodgy private sector consultants, and there's a huge range of unanswered questions including crucial ones about hospital assets, land and buildings. 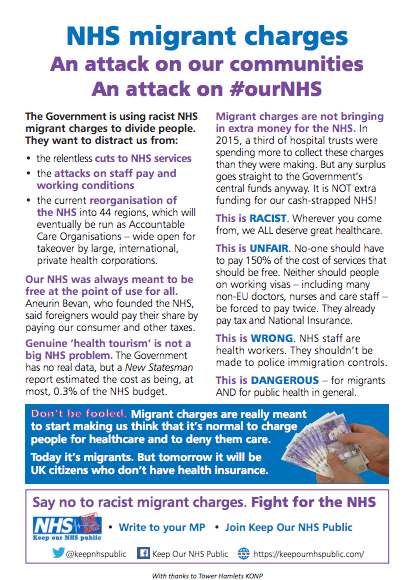 You can read the full press release from Keep Gloucestershire's NHS Public and Unison here. Jon Ashworth, the Shadow Secretary of Health & Social Care, has raised this in parliament calling it out as back door privatisation in the NHS and tweeting Labour's commitment to halting privatisation in the NHS. Campaigners in Gloucestershire are uniting against the decision and are committed to making sure it does not go unnoticed. To get in touch with campaigners in Gloucester and support them please head to our local groups page. 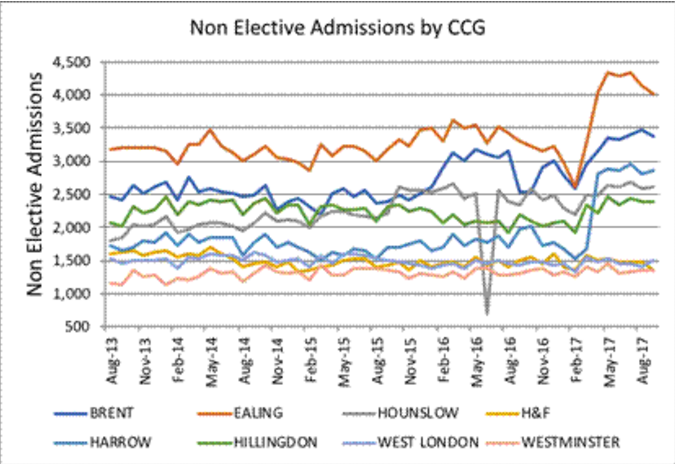 A small group of researchers in North West London have been working in conjunction with KONP group Ealing Save Our NHS and have come up with some evidence proving that CCG plans in the area are unworkable. 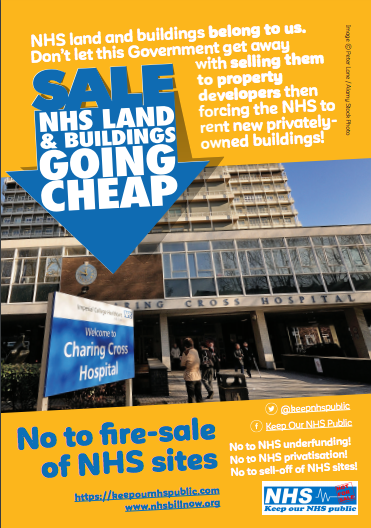 Ealing Save Our NHS are asking that campaigners across the country read and circulate a letter to NHS Improvement (NHSI) London and NHSE London directors detailing how the current plans being implemented by the CCG are clearly failing and asking the recipients to vigilantly scrutinise the proposed plans. You can read and download the full letter and a letter from Ealing CCG regarding A&E performance via the Ealing Save Our NHS website. To get involved with their campaign please search their details on our local groups page. 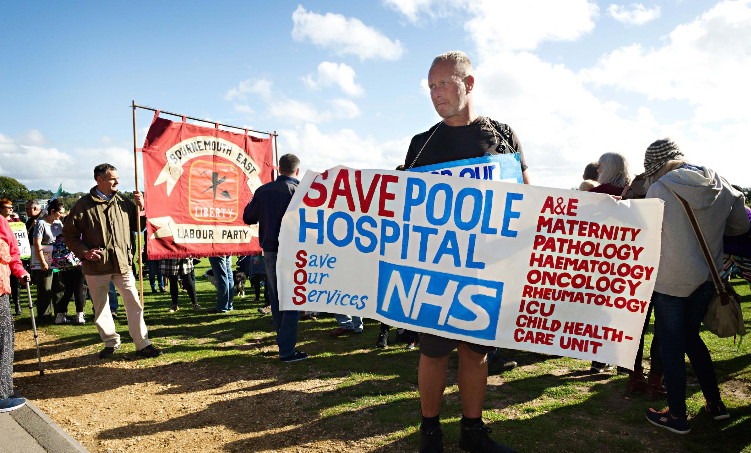 Received a message sent by Royal Bournemouth & Christchurch Hospitals (RBCH) chief executive Tony Spotswood to its governors, in which he warns that the judicial review could lead to delays and even a trip back to the drawing board. A representative from local KONP group Defend Dorset NHS spoke to BBC South Today in a programme that is no longer available online. It was a brilliant interview that seemed to suggest that the campaigners may be forcing the CCG to change its mind about these closures in the face of major public disapproval and a legal challenge. Lewisham Council agree - No cuts to CAMHS! 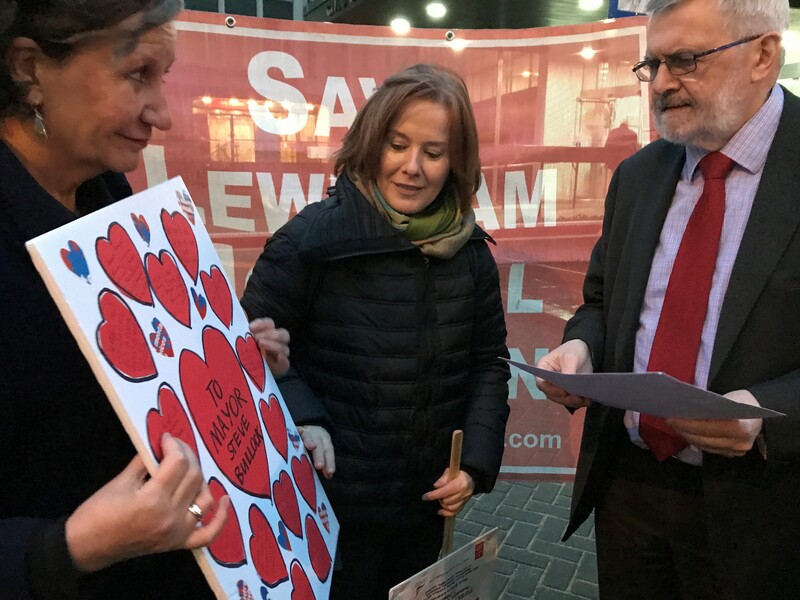 Save Lewisham Hospital Campaign held a Valentine's Picket 14 February where we asked the Mayor and Cabinet to ‘have a heart' and reverse their plans to cut a further £150k from the local Children and Young People’s Mental Health Services (CAMHS) after cutting £94k in 2017/18. We presented our 11,300 signature petition to Mayor Sir Steve Bullock asking that the Cabinet meeting that night would recommend to Council to overturn this dangerous plan on the basis of change of circumstances since the decision was made. The Cabinet agreed and now the next two years cuts will not happen now. Campaign members clapped in response. Full report on the campaign here. We thank the parents and young people who played such a role in the campaign, the many Labour Councillors, the three Lewisham Labour MPs, our video makers and editors, the local press (THREE double-page spreads), Jon Ashworth for his strong message of support, and of course all who signed our petition and attended our events. Our campaign recognise that heartless government cuts are resonsible for this pressure on councils (Lewisham has been cut by 63%) but have struck a cord with councillors in asking them to please speak out publicly as elected politicians to explain the dangers of cuts to public health, mental health and social care. We will support them when they do. We hope to support Southwark campaigners in opposing a threatened £1 million cut to Southwark CAMHS from July. Please follow this Facebook link to find out what is happening in your area. 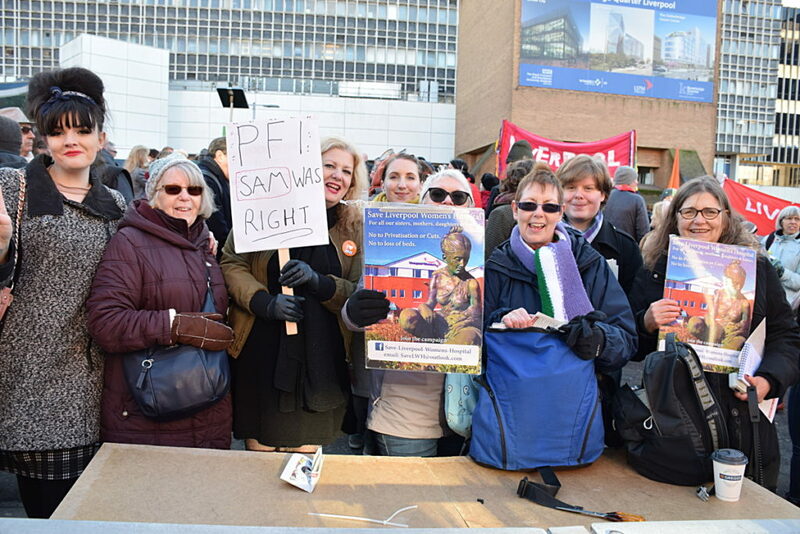 On Saturday 3rd March, Coventry Keep our NHS Public are organising a protest that will take place in the city. This follows on from the successful day of action earlier this month, where tens of thousands of people marched through central London and more than 50 local protests took place, with 100,000 participants around the country overall. Every week we hear about failures in the care services: neglect and ill-treatment in residential homes, limited care times, and poor service in users' own homes. This is aggravated by the bad working conditions and low pay of carers. In 2016 LESE asked what can be done to support and improve conditions both for service users and service providers. This seminar is a follow-on and will outline the problems of the system, point to new ways forward, and give participants the opportunity to express their own views. We have some wonderful new leaflets available that you can order or download via our online shop to aid you in your campaigns. If you would rather pay by cheque or BACS than PayPal please email Bri, the national administrator, via materials@keepournhspublic.com. We need your help more than ever. Please consider helping us in our campaigning by joining or donating. There are many appeals at present. Please remember KONP and consider a regular contribution however small – even £1 per month helps secure our ability to campaign. For instructions on how to join please head here.